Traveling around in a small motorhome to find interesting places to paint is very exciting. But, it does present challenges for an art studio. Fortunately, Tardis provides what I need. When inside, the lounge area has ample space, and the panoramic windows provide a great view. 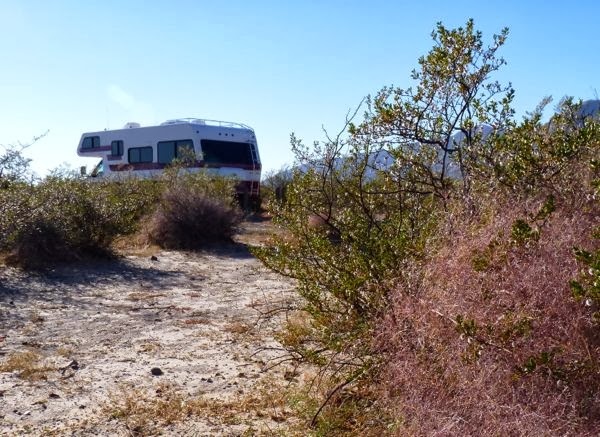 If I go out, to paint on site, the RV can take me to some really great locations. Most of my paintings are done on location in front of the subject; en plein air. All the painting supplies I use are kept in a backpack. 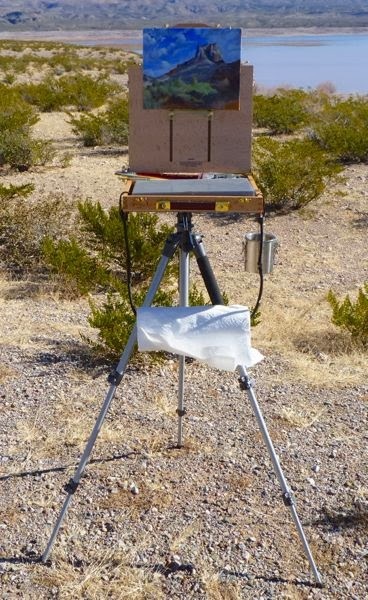 So, I can put it on, hike to a remote site, and then set-up my portable painting studio. 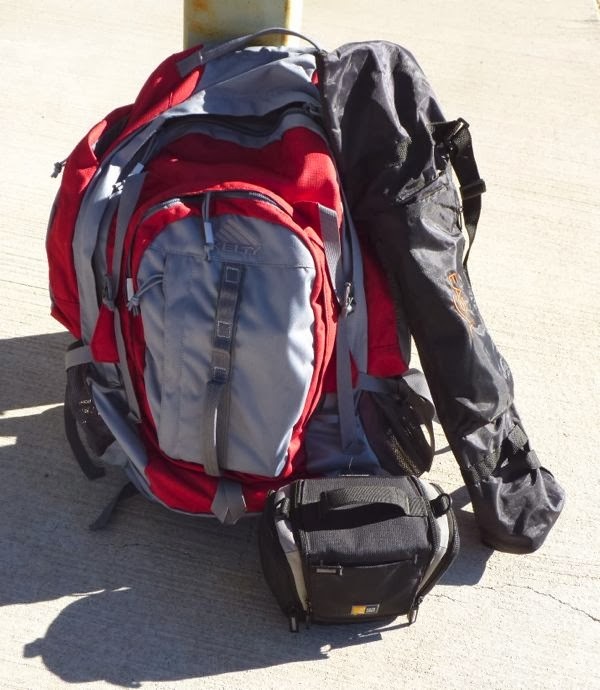 The fully loaded backpack and tripod are kept in front of the passenger seat in the cab; ready to go at anytime. I also have a monopod used with my camera and that doubles as a walking stick. Near the door is a wide brimmed hat I wear when painting outside. If the weather is poor, I’m not near a good painting spot, when preparing materials, or when I simply prefer to work indoors, I can set-up inside the RV. The EasyL paintbox works just as well on the table top, or I can use it on the tripod. Any needed materials can be set nearby. For ventilation, the windows open or the ceiling vent fan can be used. Before set-up, I put down a canvas cover over the table, which makes clean-up easy. A homemade stay-wet palette helps to keep the acrylic paints workable longer. And, all the mediums and materials I might want are at hand. Yes, space is limited so I need to choose between painting, drawing, or preparing panels. The paintings dry quickly, and are stored in bins. 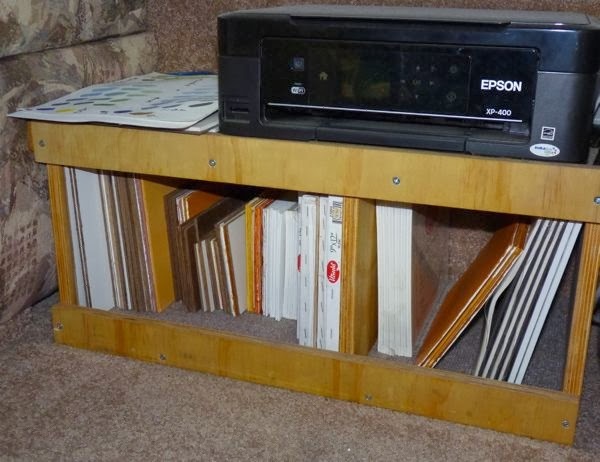 Art supplies are kept in various cabinets. Inside, I can paint a view out the window, from a sketch, or I may put final touches on a plein air piece. I work pretty much in the same manner as when outdoors. Except, I’m more likely to sit down when working inside the rig. A drink or snack is handy, and music may be played. A very comfortable painting studio indeed! So, the painting studio can be in the field or in the rig; either works well. 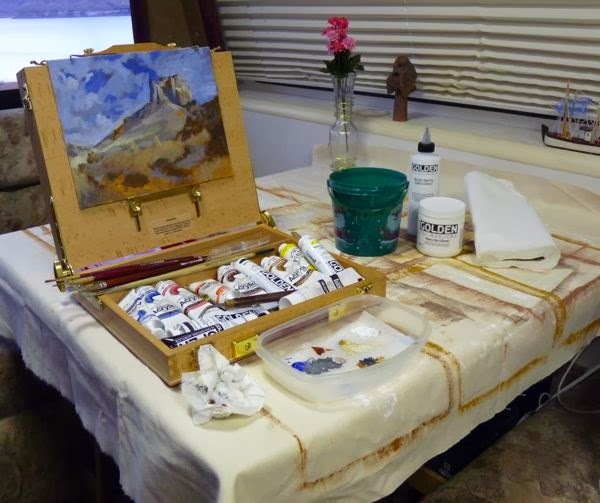 A mobile art studio in the RV makes the plein air journey possible. This is the perfect arrangement for my vagabond artist life. Nice set up! Sounds like you are living the dream! I’d love to do that. Do you live like this permanently or is this a holiday? Yes Felicity, this is how I live; traveling and painting in my RV Tardis on a plein air journey. That’s awesome! I’m working on a plein air drawing project at the moment. I’ve just spent three weeks tramping through the ranges of my home,New Zealand drawing the backcountry huts. I wish I could live like that. Would be awesome to have a camper-van and live like you do one day! Dreams can happen. It takes a real desire and a plan to make them real. Creating on location helps you see and capture the essence of a place. Keep doing it, and your artwork will improve greatly.